Classic sci-fi, mystery, and noir fiction mix with futurist questions about where society’s slippery slope may be taking us. 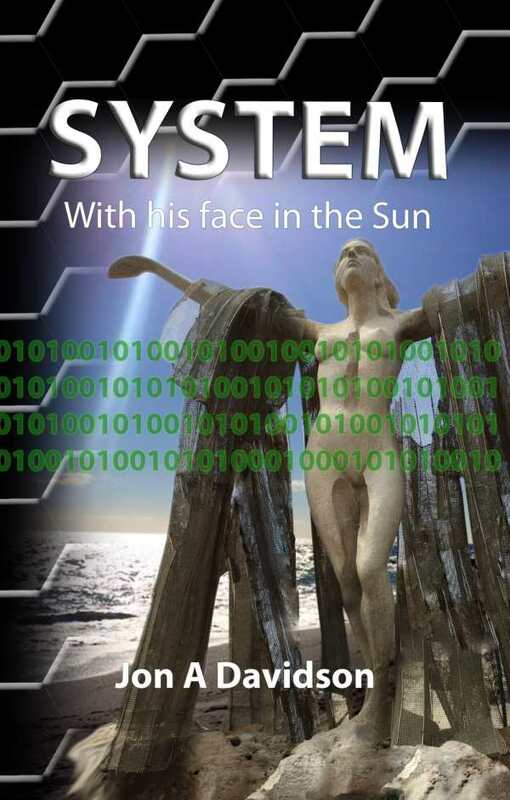 The traditions of great early science-fiction novels like Brave New World and 1984 meld with our modern world in Jon A. Davidson’s System: With His Face in the Sun. The book blends futurism and mystery to explore where the search for solutions to today’s greatest concerns could lead us. Davidson expertly delves into hot contemporary issues such as climate change, population growth, loss of privacy, and the power of the Internet. He warns that the search for answers to these problems, if not carefully evaluated along the way, could have unintended consequences on our lives and our freedom. It’s all woven into a tale that ponders how the freedom of creativity, thought, and love makes us human. Toward the end of the twenty-first century, Wallace Blair finds his life turned upside down. The “System,” which everyone is convinced is always right, both in advice and future predictions, informs him that his marriage is about to end: “Quietly they held each other, neither wanting to say anything, both knowing the Transition would happen. The System knows everything.” His struggle to accept this launches a quest to find his grandfather, who he’s been told succumbed to dementia. He soon finds himself embroiled in a mystery. What happened to his grandfather isn’t what he’d been told. A dangerous secret about the System has been kept hidden, and Wallace is determined to find out what it is. As answers unfold, the snares around him close, and he (and the world) may never again be truly free. Davidson’s book feels largely inspired by George Orwell and Aldous Huxley; in fact, one character’s name is George Orwell’s real middle and last name (Arthur Blair). The book mixes mystery and noir fiction with classic futurist questions about where society’s slippery slope may be taking us. Characters are compelling and well written. Wallace’s struggle to leave the seemingly safe guidance of the System feels very real, as the risk of freedom scares him. As one wise person says, “If that information is always seemingly correct, and the vast majority follow its every recommendation with near-religious zeal, it takes a brave soul to stand alone and question the System.” The plot keeps pages turning as every answer only leads to another question: Where is Wallace’s grandfather? Why did he make the choices he did? What is so dangerous? Davidson’s world is built on technology emerging today—smart watches, self-driving cars, and more. The setting feels familiar and highly possible, and it makes the concerns raised about the solutions to society’s problems seem all the more realistic and thought-provoking.